When we think of summer, we think of sunshine, swimming, the beach and fun nights out with friends. While summertime is about having fun, your hair might not enjoy these activities as much as you do. Unfortunately, some of your favourite summer activities can damage your hair. 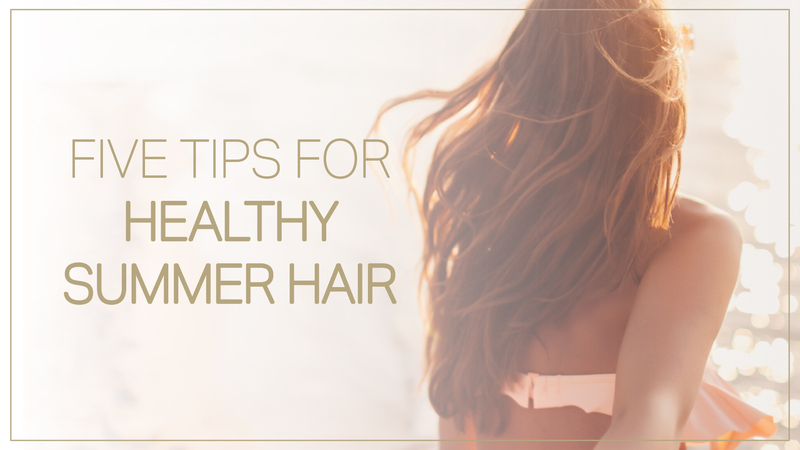 Luckily for you, though, we have a few tips to help you have healthy summer hair. You’ve been told since you were little to rinse your hair after swimming to get rid of any chlorine and salt residue. Chlorine and salt can damage your hair by stripping it of its natural oils, which causes drying, increased porosity and brittleness. Make sure to wash your hair after swimming to wash away any leftover chemicals that may continue to dry out your hair after swimming. Additionally, rinsing your hair before swimming promotes healthy hair. When you rinse your hair first, your hair soaks up the fresh water – even down to the roots! – and helps to repel pool chemicals and salt water. Summer is the perfect time to embrace your hair’s natural waves. Instead of turning to heat products like curling wands or straighteners, show off your healthy summer hair and beachy waves for a fun, laid-back look. Heat products damage and dry out hair, leaving it looking limp, withered and unhealthy. If your look relies on the use of heat tools, make sure to use proper heat protection products before and after styling your hair to keep your head safe and healthy. Much like heat styling products, a lot of time in the sun can damage your hair. The easiest way to protect your hair from the sun’s rays is to limit sun exposure altogether. Spending more time in the shade or wearing a hat reduce exposure without going indoors. If you do tend to spend a lot of time in the direct sunlight, make sure to take the time to encourage proper hair health. Using a leave-in conditioner will help your hair’s recovery after sun exposure. A hair product that contains SPF protection (like sunblock) will protect your hair during exposure. Healthy hair and fun in the sun are not exclusive, you simply have to put in a little extra preparation. Staying hydrated seems to be the solution to many problems, and we agree! Dehydrated hair will appear dry and withered. Drinking lots of water will make sure that the cells responsible for healthy summer hair growth are able to do their job effectively. So, top up your bottle a few extra times daily in order to keep your hair’s growth and appearance on track. A great way to make sure you have healthy summer hair is to start the summer with a haircut at Caralyn’s. Starting the summer with a fresh cut will tidy up your look by trimming away dead and withered ends. A trim at the beginning of the summer will also keep you cooler on hot days. A fresh hair gives you a fresh perspective; what better way to start the summer? Now that you are armed with the proper tools to achieve healthy summer hair, what are you waiting for? Hit the beach, dive into the pool or lounge out with a book; summer is here!